Women feeding gulls while crossing Oregon Inlet on a state ferry, 1962. Image credit: Photograph by Hugh Morton. © UNC-Chapel Hill Libraries. “Grandfather Masterpiece,” 1945. Image credit: Photograph by Hugh Morton. © UNC-Chapel Hill Libraries. “Wheat, Ashford,” 1949. Image credit: Photograph by Hugh Morton. © UNC-Chapel Hill Libraries. Vince Carter dunk versus the University of California, Berkeley, 1997. Image credit: Photograph by Hugh Morton. © UNC-Chapel Hill Libraries. An exhibition at the North Carolina Museum of History opens this week that showcases the work of the man who put Grandfather Mountain on the map. 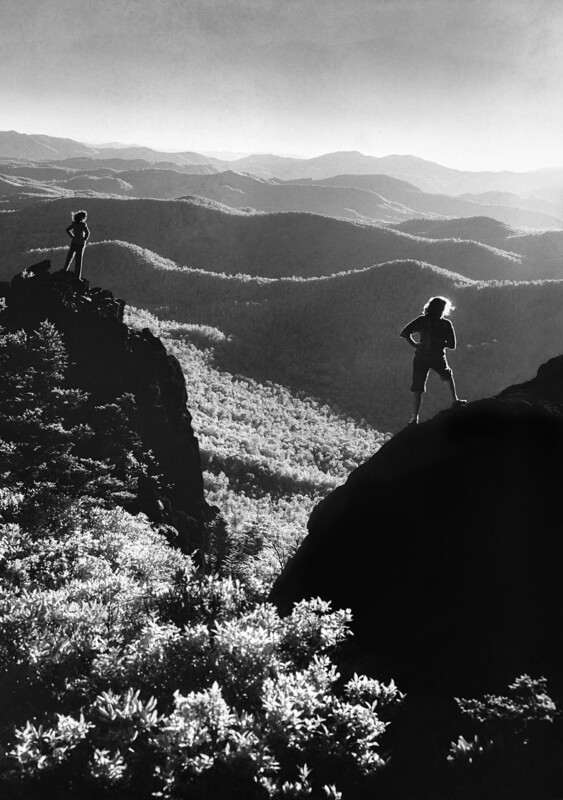 Environmentalist Hugh Morton took iconic photos of North Carolina people and places that appeared in national publications like Time, Life, National Geographic, Esquire, and many others. Morton developed his interest in still photography while in college at the University of North Carolina at Chapel Hill. He then served as a newsreel photographer during World War Two, and continued to work behind the lens after the war. In 1952, he inherited property in Avery County that included Grandfather Mountain. He opened it as a tourist attraction, building the swinging bridge and visitor center. "He had the vision that people were taking road trips, spending summers traveling in their station wagon," says grandson Jack Morton. "Over time, it became appreciated as a unique environmental location. As areas around the mountains started to develop, Grandfather Mountain remained this bastion of environmental purity." Hugh Morton also photographed football and basketball at UNC Chapel Hill for more than six decades. Though many of Morton's more familiar photos have been in the public for years, Jack Morton says the current photo exhibition shows a seldom seen side of his work. “What’s special about this exhibit is it shows his deeper, fundamental artistic background and understanding of photography. It’s really spectacular to see these more obscure images that they have basically dug up over the course of ten years - archiving, cleaning, and scanning his work." The exhibit features 87 photographs, including some of his better-known works alongside these rare images. It runs through September 2017.